Richard Jewson Esq, JP, HM Lord-Lieutenant of Norfolk officially named Greater Anglia Class 90 No. 90009 Diamond Jubilee in a ceremony at Norwich station on Monday 30 April 2012. The locomotive is part of the Greater Anglia fleet which operates Intercity train services on the Norwich – Ipswich – Colchester to London Liverpool Street GE mainline route, and now carries a special Diamond Jubilee nameplate and commemorative artwork to celebrate the forthcoming Diamond Jubilee of Her Majesty The Queen. The fitting of ‘Diamond Jubilee’ nameplates to this Class 90 continues a long-held tradition of naming locomotives operating on the Norwich to London mainline route in recognition of special events, regional organisations and historical figures. No. 90009 was previously named The Royal Show between 05/89-03/94 and The Economist between 03/94-12/04. Nexus, which owns, manages and is modernising Newcastle Metro, is investing in new escalators at two of its busiest Metro stations in Newcastle city centre. Monument and Central Metro stations are both set to undergo escalator replacement work over the next 12 months. A total of eight new escalators are being installed with the work scheduled for completion in March 2013. The work forms part of the £385m Metro all change modernisation programme which will see the network transformed over the next 11 years, including new-look trains and refurbished stations. The work will be carried out in phases, planned so that Central will always at least have one escalator in operation and one in each direction available for both lines that run through Monument station. Both stations also have passenger lifts to the platform level. The £385m Metro all change programme will see a whole host of modernisation projects during 2012. The new generation of ticket machines are currently being installed, with almost half of the network now completed. The new ticket machines, 225 in total, which accept bank notes and credit and debit card payments, are going in at all 60 Metro stations. Work will be ongoing to fit 13 key Metro stations with electronic ticket gates similar to those used on the London Underground system. New passenger lifts will also be fitted at Heworth Interchange in Gateshead and Four Lane Ends Interchange in North Tyneside in the next year. Train operator South West Trains and infrastructure operator Network Rail announced on 30 April 2012 the launch of a new alliance with the aim of delivering better rail services in the south and south-west of England. A single senior joint management team now has responsibility for both trains and track on the route operating out of London Waterloo in a first for the UK rail industry. It is aiming to cut delays for passengers, provide better customer service, deliver more effective management of disruption, and improve the efficiency of the railway through more collaborative working and better decision-making. The new alliance is also expected to benefit rail freight operators who use the Wessex route. The alliance, which officially went live on 29 April, is a first for the UK rail industry and has been approved by the Department for Transport and the Office of Rail Regulation. The alliance is planned to run until 4 February 2017, the expiry date of the South West Trains franchise agreement. The creation of the alliance follows the publication of the McNulty Report last year, which recommended a package of measures to reduce inefficiencies in the UK rail system. It also delivers a key element of the Government’s Rail Command Paper, issued in March 2012, which called for closer co-operation between operations and infrastructure. The alliance also builds on the existing joint working between South West Trains and Network Rail through the Wessex Integrated Control Centre at London Waterloo, which co-ordinates the operational response to incidents on the route, as well as recent moves by Network Rail to devolve operational responsibility to regional units. Sir Brian Souter, Chief Executive of Stagecoach Group, the parent company of South West Trains, said: “This new model is a real opportunity to deliver change that will benefit both passengers and taxpayers and support our objective of growing the railway. Safety will continue to be our top priority and will remain at the core of the way we run the railway. By working more closely with Network Rail than ever before, and with aligned incentives, we can deliver a more customer-focused and more efficient railway for the long-term." David Higgins, Chief Executive, Network Rail, said: "This marks a new phase in the evolution of Network Rail as we continue to push decision making away from the centre, empowering our front-line managers to run the railway more effectively, and forging closer working relationships with our customers, the train operators. Network Rail will continue to focus on delivering our obligations to all parties, protecting the interests of all customers whilst maintaining the seamless operation of the whole network." * More effective station management: a single management team for London Waterloo, the UK’s busiest railway station with more 90 million passengers a year. * Better planning of track maintenance work: smarter train planning and improved access to provide more time for renewals, leading to a more reliable and punctual train service. * Improved response to disruption: a single team dealing with operational incidents on the network through the Wessex Integrated Control Centre. * Faster decision-making: quicker resolution of issues through joint responsibility for work at stations. * Aligned objectives and incentives: employees from both organisations working towards common goals with consistent incentives to improve performance. * Building skills: cross-functional development opportunities for employees, enhancing skills and providing wider job experience. * Pooled resources: opportunities to share facilities, helping with winter preparations and providing a more efficient response to train service disruption. The alliance senior management team will be headed by Tim Shoveller. Tim began his career working as a train guard at Guildford, and his 20-year railway career has included senior management positions at Virgin Trains and Eurostar. More recently, he headed up the East Midlands Trains franchise for four years, before moving onto become Managing Director of South West Trains in January 2012. Fire crews were called to Clarborough on 27 April 2012, after Class 142 'Pacer No. 142091 was derailed on emerging from Clarborough Tunnel near Retford. The unit, forming the 11.25 Lincoln to Adwick, collided with a landslip just outside the tunnel mouth at 12.15. There were 17 passengers on the train, who were evacuated after the unit came off the tracks, two people being taken to hospital by ambulance. The lower cab front and coupler area of leading car No. 55787 suffered damage caused by a tree trunk in the debris. Growing Bristol’s railway is vital to the success of the city’s new enterprise zone, says Patrick Hallgate, route managing director for Network Rail. At the launch event of the enterprise zone on 27 April 2012, Network Rail shared its rail vision in redeveloping Bristol Temple Meads into a world-class railway hub. 1. Station capacity improvements to ease current and predicted passenger congestion - A new eastern station access to ease congestion and provide a convenient link across and around Temple Quarter - A light and airy subway extension under the existing forecourt to provide a welcoming environment and improve retail opportunities for local businesses, whilst preserving the vistas of the historic grade 1 listed structure. Complementing this proposal, Network Rail also recommends a number of infrastructure enhancements to provide additional capacity, improved journey times and operational flexibility on the railway around Bristol. These recommendations include remodelling of a key junction into the station area, additional infrastructure on the line to Bristol Parkway and line-speed improvements to the south west. Network Rail engineers have begun work to repair damage caused to the railway by a landslip early on 27 April 2012 on the Highland main line between Carrbridge and Slochd. The engineering works are expected to be completed in time for the start of services on Wednesday, 2 May 2012. More than 2,000 tons of rock will be installed to stabilise the affected line after a 60ft section of the railway lineside gave way shortly after 08.00 this morning due to heavy rain. Freightliner, has made a significant investment in new container wagons. Freightliner has placed an order with VTG, for a fleet of twin platform Ecofret ‘Shortliner’ wagons to meet the evolving deep sea container market towards 40ft containers. The 40ft deck length wagons are designed to maximise the amount of 40ft containers that can be hauled on one service without empty running or 20ft wasted space. Ecofret ‘Shortliner’ wagons are enabling Freightliner to maximise port and inland capacity, reduce CO2 emissions and increase network utilisation by maximising the amount of boxes that can be hauled on one service. Freightliner, through the use of these new wagons and the operator’s unique ability to haul longer, heavier trains, using the state of the art PowerHaul Class 70 locomotives, are creating Shortliner services. Through Shortliner services, Freightliner is increasing the amount of 40ft containers hauled per train by over 42% in comparison to a standard Class 66 service hauling 24 wagons, whilst still fulfilling the 20ft market demand. The high speed services are being funded by Kent County Council to boost business confidence and support new employment opportunities in East Kent following Pfizer’s announcement last year to exit their site in Sandwich, and will provide further incentive for new business and job growth in the Discovery Park Enterprise Zone. Demand for Southeastern’s high speed service has grown steadily since they were launched in September last year. The high speed peak services cut the journey time from Deal to London to approximately 90 minutes, compared to the Mainline service, which is 135 minutes. The extended, late night high speed service from London St Pancras to Ramsgate, is expected to be welcomed by those working late or enjoying a night out in London. Bryan Sweetland, Kent County Council Cabinet Member for Environment, Highways and Waste, who chaired the 4th Kent Rail Summit, at County Hall, Maidstone, said: “The launch of late night high speed services to East Kent is great news for the area, providing a further boost to business. It will significantly benefit tourism, building on the tremendous success of the Turner Centre and resulting increase in visitor numbers. This comes as part of our continued support of high speed services to Sandwich and Deal following their successful launch. We aimed to pump-prime the service to boost business and job prospects in the area with a move that was called for by local residents. This is good news for the local people and businesses. We worked closely with Southeastern and local MPs to secure high speed rail services at the lowest possible cost, initially on a trial basis for one year. As a result of strong passenger figures we have been able to reduce the level of our revenue support considerably. As service use grows the potential to extend it to provide a full timetable throughout the day will be a real possibility, which will boost local business prospects still further." Vince Lucas, service delivery director for Southeastern said: “We have been working more closely with Kent County Council than ever before to deliver real improvements for passengers using our services, and we’re seeing a growth in passenger numbers and satisfaction is at an all time high. “We’re delighted to continue the partnership with Kent County Council to provide high speed services to Sandwich and Deal. The service is a key transport link between the coast and London. From September we will be extending the evening service departing 23:12 from St Pancras to also include stops at Sandwich, Deal and Ramsgate. This means passengers have another transport option to get home following a night out in London"
Cambridgeshire County Councillor, Susan van de Ven, has this week awarded David Piggott, a Sales Assistant at Meldreth Railway Station, with a First Capital Connect (FCC) Stakeholder Recognition Award. David was nominated for the award due to the large number of compliments sent by members of the local community to FCC’s Customer Service Director, Keith Jipps. Several people commented on David’s eagerness to help, positive outlook, and for constantly going beyond the call of duty. The award, launched last year, provides FCC’s stakeholders with an opportunity to show their appreciation for their local station teams and the service they provide to their customers. GB Railfreight (GBRf), has named Class 66/7 No. 66709 Sorrento to celebrate a 10-year partnership with the Mediterranean Shipping Company (MSC). The promotional-liveried locomotive was unveiled at a special ceremony at the Port of Felixstowe on 25 April 2011, where GBRf has its Intermodal headquarters. The locomotive was unveiled by GBRf Managing Director John Smith and Maurizio Aponte, Director of MSC Europe, with 70 guests of MSC and GBRf present. Amanda Wilson has joined GB Railfreight (GBRf) as the new Head of Coal. She replaces Phil Webster, who was appointed Head of Contract Management in October last year. Amanda brings with her a wealth of experience in the rail industry. She joined British Rail’s Youth Training Scheme at the age of 16 in 1983 and worked first in a passenger ticket office before moving into clerical support. Her first coal related role was in 1989 working for East Midlands Freight as a Coal Controller, based in Nottingham. Before joining GBRf she worked for EWS in various positions within the coal team, before becoming the Coal Team Leader and most recently was Account Manager Coal for DB Schenker. Amanda’s appointment is the latest in a series of changes brought in by GBRf’s Managing Director, John Smith, designed to boost the company’s already excellent standards of customer service. Network Rail has launched a series of educational videos to help teachers promote engineering in the classroom. The 15 videos are available to view on YouTube www.youtube.com/networkrail and each aims to bring to life how all the different aspects of engineering helps to keep Britain’s railways running. Viewers will see operations in depots, on track and in laboratories and manufacturing plants to illustrate the challenges in an engaging and informative way. Stories range from how Network Rail controls trains to level crossing design, how rail is manufactured, and what materials are used and how they help build and maintain the tracks. The videos are part of a wider schools engagement programme including STEM (science, technology, engineering and maths), ambassadors, involving our young engineers and technicians in career fairs and events in order to bring what is learnt in the classroom into real life, and show the career options available, and encourage the very best talent to join the rail industry. The 15 videos range between 2-20 minutes in length and each video is accompanied by teaching challenges provided by the JCB Academy – a university training college in Staffordshire that has worked closely with Network Rail since 2010.The challenges meet the requirements of recognised national qualifications and can be used across a range of educational activities. As well as promoting these videos via YouTube, Facebook and Twitter, Network Rail will write to schools to help them make the most of these free teaching resources. Week of 12 April – land purchase completed, Horsforth. July – track works in Horsforth. 25 August and 1 September – new crossovers installed at Horsforth to give access to turnback – train service affected for 30 hours. 13 to 29 October, full road closure at Rigton Level Crossing, Rigton to allow the conversion of the level crossing to a manually controlled CCTV crossing. HS1 Ltd, the owners of the UK's first and only high speed railway, and Network Rail have signed a new deal, extending Network Rail’s contract to operate and maintain High Speed 1 until at least 2025. Patrick Butcher, Network Rail's group finance director, said: "We have run HS1's infrastructure since the current route opened in 2007 and have delivered a high standard of punctuality and overall performance for our client and the route's users - a standard that we aim to continue for many years to come. The new contract offers our client even better value, and allows HS1 and its customers to share in outperformance through the continuation of the excellent partnership that has been established." HS1 remains among the world's most reliable railways with an average train delay of between six and eight seconds. Passenger numbers continue to grow every year since opening. Network Rail operates, maintains and renews the High Speed 1 railway through a wholly-owned subsidiary, Network Rail (CTRL). A new deal has been agreed with HS1 Ltd giving HS1 Ltd a new fixed price featuring a 10% reduction in costs to 31 March 2015 and moving its break-clause rights to 2025. Beyond 2015 a new fixed price will be agreed, determined through the periodic review process with the ORR for HS1's control period 2 (2015-2020) and control period 3 (2020-2025). Network Rail will now be involved in, and bound by, this review process. The new deal also sees both parties share 50/50 in any financial outperformance by Network Rail. HS1 Ltd will in turn share 60% of its discount and outperformance with its customers (i.e. the train operators who use the route). Various other changes were made to the contract too – to improve communications between the organisations and outcomes for customers. Network Rail (CTRL) also manages three of HS1's stations - St Pancras International, Stratford International and Ebbsfleet International. HS1 Ltd, is owned equally by Ontario Teachers' Pension Plan and Borealis Infrastructure Ltd, and acquired a 30-year concession to own and operate the High Speed 1 railway in 2010. West Jesmond and South Gosforth stations are to be upgraded to staffed Metro stations, with refurbishment work starting this summer. The two stations, used by around three million people a year between them, are the latest to benefit through the £385m Metro: all change modernisation programme. People can find out more about plans for West Jesmond at the Jesmond Festival this coming weekend - with Metro staff at the station itself for a drop-in session at the Platform 1 ticket concourse from 10am to 2pm on Friday, 27 April, and at the Grand Festival Fair at West Jesmond Primary School from noon to 3.30pm on Saturday, 28 April 2012. A video about the plans, made by community news website Jesmond Local, can be viewed here. Once refurbishment is complete and new ticket gates are switched on (in spring 2013) both stations will be staffed on both platforms from 7am to 7pm, improving security and passenger confidence. Approach routes will be improved with a new wider and tree-lined pathway at West Jesmond, plus new cycling and recycling facilities leading to a new larger entrance hall and gateline. Throughout the station interiors, exteriors and floors will be refurbished creating a brighter, cleaner and safer feel, while new canopies will be built centred on the current train stopping points. South Gosforth will also get improved pathways with better step-free access and cycle storage. There will be new larger and brighter concourse buildings and refurbished platforms. New ‘smart’ ticket machines will be installed at both stations accepting notes and credit/debit cards along with coins, and opening the way for future smartcard transactions. Metro plan to start work in June with work completed by the end of the year. The stations will remain open throughout, though at times we may need to close one or other platform – look out for details when work starts. Work on Harpenden station’s main car park is now complete with a brand new surface, more spaces and better lighting and drainage. In response to customer feedback, the poor surface was replaced over the Easter school holidays (2-13 April) during which time the car park was closed. The spaces were marked out anew at the weekend. Before the work, a maximum of only 420 vehicles parked in this east side car park. Through relining and reclaiming waste land, up to 456 can now park (this includes five disabled spaces). Five new lamp posts have been installed: three in the approach road and two in the car park where the area was previously poorly lit. All the lamp heads were also replaced on the existing poles. And new drainage with 14 soakaways was installed along the boundary with platform 1. The smaller west side car park is planned for refurbishment later on a date to be announced. Milngavie’s railway heritage is being celebrated with a new poster at the town’s station. The poster features eye-catching photographs of railway staff, trains, and facilities at Milngavie station between 1920 and 1960. ScotRail has worked with Milngavie in Bloom, East Dunbartonshire Leisure and Culture Trust, the James F. McEwan Collection and Don Martin, from Milngavie Heritage Centre, to source the historical images. The poster, funded by ScotRail, is on display alongside signs it installed in autumn 2011 to commemorate the extraordinary propeller-powered Bennie Railplane, which ran on a nearby test-track in 1930. Milngavie in Bloom also maintains planters and flowers beds at Milngavie as part of ScotRail’s Adopt a Station community project. Rail passengers travelling on the popular Harrogate line will now find it easier to purchase their train tickets, thanks to the recent installation of Ticket Vending Machines (TVMs) at several stations along the route. ‘Card only’ machines have been installed at both Starbeck and Pannal stations, with Headingley station next in line. Northern Rail has introduced 68 machines across its north east region allowing passengers to collect pre ordered tickets and to make their journey and the travel experience as easy as possible. Northern has also added a ‘ToDler’ machine at Harrogate station, which provides a collection only facility, allowing passengers to collect tickets they have bought online, without waiting for other passengers to purchase tickets through the same machine. First Hull Trains is the first train operator on the East Coast main line to offer its passengers e-tickets direct to their smart phones. Currently, anyone using the First Hull Trains App can search train times, buy tickets and get up to date information direct to their phone. However, although already one of the most flexible train operating companies in the country offering an on board ticket collection and an online booking service, a great many passengers still have to collect a paper ticket from a ticket office or self-service machine at stations using the credit or debit card the ticket was bought with. Now, the App upgrade will mean passengers are sent an electronic version of the ticket direct to their phone. Katie Beckett, Customer Services Manager of First Hull Trains, said: "We are always pushing to be as innovative as we possibly can be, this is just a further step forward in the first class service we offer our loyal customers. At First Hull Trains, we have a proud history of pushing the boundaries of customer service, always endeavouring to make the journeys on our trains as simple and relaxing as possible. By offering the e-tickets direct to smart phones through the App we save passengers time and we reduce the worry of losing or misplacing tickets – which happens from time to time." The new App, which was launched this week, enables tickets to be sent directly to the phone after being bought online. The passenger will then follow simple onscreen instructions to activate the ticket before showing the train manager the e-ticket on their phone. Cath Bellamy, First Hull Trains' managing director, said: "At First Hull Trains we have always had a pioneering ethos which has shaped how we deliver our services to the people of Hull and those who use our service en route to London. We are continually striving to improve our customer experience. To that end, we have invested heavily in upgrading our fleet of trains, including the introduction of free wi-fi throughout the majority of our fleet, and we were recently recognised as the East Coast Main Line’s best performers for reliability and punctuality. We hope this latest technological advancement in ticket purchasing makes travel even more enjoyable." The App is a free download and available on the iPhone, Android, Nokia and Blackberry systems. Graham Taylor from Beverley, said: "Smart phones and the digital innovation which comes hand-in-hand with them is without question the future. Westminster City Council has given its approval for the regeneration of Tottenham Court Road and the east end of Oxford Street, including the former Astoria site. The development plans, submitted in conjunction with Derwent London, are for two above ground developments located over each ticket hall of the integrated Tottenham Court Road station that will serve both Crossrail and London Underground passengers. The 500,000 sq ft of premium retail, office and residential accommodation will cover four blocks, boosting the economy in the eastern end of Oxford Street and Tottenham Court Road. It will also deliver a significant contribution towards the Crossrail funding package. A new theatre to replace the former Astoria Theatre has also been approved. Derwent London has entered into an agreement with Nimax who will operate the new 350 seat theatre. London Underground and Crossrail have also gained approval for plans to renew and upgrade the public spaces around the eastern ticket hall and St Giles area. A new open pedestrian space linking Soho Square and Charing Cross Road will create new views of the Square and of St. Patrick’s Church. The proposals link into wider efforts by London Underground, Crossrail, Transport for London (TfL), Camden Council, Westminster City Council and Design for London to improve the area around St Giles Circus. A new public piazza around Centrepoint will also be created providing a distinctive new landmark for the West End. The arrival of Crossrail will make Tottenham Court Road a major West End transport hub. 150,000 passengers use Tottenham Court Road station every day. That number is expected to rise to more than 200,000 when Crossrail services commence in 2018. Crossrail will link the West End to Canary Wharf in 12 minutes, Stratford in 13 minutes and Heathrow in less than 30 minutes. In total, £1bn is being spent to build the new Crossrail station and upgrade the capacity of the Tube station. The private sector-funded over-site developments will be built once work to construct Tottenham Court Road station is complete in 2017. Crossrail will commence services in 2018. Crossrail has begun drilling wells at Connaught Tunnel to draw down the water table ahead of works to deepen and widen the 130 year old tunnel in east London. Once the wells are completed, drawing down of the water table will begin next month which is required ahead of works to widen and deepen the central section of the Connaught Tunnel so it can accommodate Crossrail’s larger trains. The water table is also being lowered to allow for the pump house shaft to be deepened by another seven metres to 25 metres in order for it to accommodate modern pumping equipment that will work to keep the tunnel dry. During the coming weeks the 130 year old pump house will be removed brick by brick and will be donated to Newham Council. This attractive Victorian building is too small to accommodate the larger modern pumping equipment that will be installed as part of the tunnel’s major refurbishment. Demolition of the former North London Line station at Silvertown has now commenced. Works in Connaught Tunnel are well underway with the ballast – loose stone ground cover – and rail tracks already removed. Major piling works are also underway at the western approach to the tunnel in order to strengthen the ground. Survey work for to identify potential unexploded ordnance from World War II has been completed in the tunnel’s western approach with the all clear given. Crossrail’s archaeologists have opened their fourth and final trench for the site, searching for possible evidence of human activity dating back 6,000 years. Sections of the existing tunnel are in a poor structural condition. In 1935, larger ships began scraping the bottom of the Royal Victoria Dock which sits above Connaught Tunnel. As part of work to deepen the dock, the central section of the tunnel was narrowed with brickwork removed and steel segments installed. Crossrail originally planned to strengthen the central section of the tunnel by removing the existing steel linings and back filling the entire section with concrete foam. These tunnels would then have been enlarged by boring through the concrete to create tunnels large enough for Crossrail trains to pass. However, concerns about the structural integrity of the tunnel as a result of work in the 1930s to narrow the tunnel have led to a new approach which will involve workers digging down to the tunnel to undertake the enlargement work. This will be the first time the tunnel has been exposed from above ground since its construction in the 1870s. One of Ayr’s most famous sons – engineer John Miller – is to be honoured with a plaque at ScotRail’s station in the town. The tribute to the pioneering railway designer, who was born in Ayr in 1805, will be unveiled by Provost Winifred Sloan at a ceremony on Wednesday 25 April 2012. Miller led many of Scotland’s greatest rail projects, alongside business partner Thomas Grainger. These included Scotland's first inter-city railway, the Edinburgh-Glasgow line, and what was once the largest masonry arch in the world, the Ballochmyle Viaduct. The permanent plaque at Ayr station has been funded by the Institution of Civil Engineers, which is keen to ensure Ayrshire remembers Miller’s important role in the development of Scotland’s railways. Another plaque commemorating Miller’s life was unveiled by Sarah Boyack MSP at Edinburgh’s Haymarket railway station in 2005, on the 200th anniversary of his birth. The Tyne & Wear Metro has installed a new state-of the art Wilcomatic train wash plant at its depot as part of the major system upgrade currently underway. Nexus, which owns and manages the Metro, said the original 30 year old washing plant had become a “maintenance burden”, and decided to upgrade it as part of the £385m ‘Metro: All Change’ modernisation of the entire network. On Friday 27 April between 11.00 and 17.00 and on Saturday 28 April between 10.00 and 16.00, the public are invited to a special open event at the site of the historic York rail roundhouses. The event will be on a first come, first served basis. Visitors should go to the site entrance on Cinder Lane in York and wear sturdy footwear suitable for rough, dirty terrain. Foundations for the North Eastern Railway roundhouses which were abandoned in the 1960s have been uncovered by Network Rail in York and are being opened to the public this month. The intention is that the rail operating centre (ROC) will eventually control all rail operations on the east coast. The workforce development centre will consolidate training services already provided to rail employees at a number of locations around the route into a single, purpose-built facility. Around 500 jobs will be spread over the two facilities when fully operational. Virgin Trains has won another prestigious award, being voted the top long-distance franchise operator for 2012 by leading industry experts. The Institute of Transport Management placed Virgin Trains at the top of the industry, beating UK operators and SNCF-owned Eurostar. The ITM based its award on areas including price, frequency, punctuality, health and safety, comfort and cleanliness. It is because of this that the Institute of Transport Management has given Virgin Trains the award of “Long Distance Franchise Provider 2012”, in respect of the full service offering that it provides its customers. Virgin Trains has recently been named best train operator by Which? Magazine, and is top of the long-distance train franchises by the independent National Passenger Survey. It also won best rail operator last year in the Daily Mail Globe Travel Awards. Travellers will now find it even easier to travel by public transport as South West Trains has installed a new railway ticket machine at Southampton Airport. The new style ‘ticket on departure’ machine for collecting tickets will provide a quick and easy way for passengers to collect their pre-booked railway tickets. Dean Pettitt, Station Manager, South West Trains, said: “This is the first time South West Trains has installed one of its ticket on departure machines at an airport. With many passengers now choosing to buy their tickets through our website, we wanted to provide even easier access to passengers simply wanting to collect their pre-booked tickets and who don’t necessarily need to queue at one of our full service ticket machines”. Owned by BAA, Southampton Airport sees nearly 2 million passengers travelling each year. Taking passengers to international destinations including: Amsterdam, Bergerac, Dublin, Hanover and Paris; airlines servicing Southampton Airport include: Air France, Aurigny, Blue Islands, Eastern Airways, Flybe, Skybus, Thomas Cook, and Veuling. To book the best price train tickets, visit southwesttrains.co.uk/advance or call 0845 6000 650 for more details. First Capital Connect (FCC) has embraced a feature of Twitter to help passengers during times of disruption. FCC is grouping tweets about major service disruption under the hashtag #FccDelay. By searching the hashtag, passengers will be able to see at a glance all the questions and answers shared by FCC with other customers about problems with the train service on either the Thameslink or Great Northern routes. The hashtag has been posted on information screens at two stations as a trial and are to be advertised across the network. Unused rooms at one of Scotland’s oldest working railway stations have been transformed into a clubhouse for model railway enthusiasts, thanks to a ScotRail community project. Kyle Model Railway Club this week moved into the revamped rooms above the main premises at ScotRail’s Irvine station, which dates back to 1839. The award-winning club has ‘adopted’ the station as part of ScotRail’s Adopt a Station project, which enables volunteers to develop floral displays at stations and find innovative uses for vacant rooms. The clubhouse, which was previously used as a training suite, offers an attractive space for railway enthusiasts to exhibit their miniature railway layouts. John Yellowlees, ScotRail’s external relations manager, opened the new clubhouse on Monday 16 April 2012. The accommodation has been converted with assistance from the Railway Heritage Trust and IDP Architects. Irvine is the fifth ScotRail station to house a model railway club, with others at Gleneagles, Lanark, Fort Matilda and Maxwell Park. From 20 May 2012, Northern Rail is introducing nine additional return Sunday services between Manchester Victoria and Rochdale. The extra trains will provide more capacity on the route and will depart from Victoria at 48 minutes past the hour from 09.48 until 17.48, and from Rochdale at 22 minutes past the hour from 10.22 until 18.22. These will call at local stations including Castleton, Mills Hill and Moston. During the times that the new trains are running, the existing Calder Valley trains from Leeds will not call at Castleton, Mills Hill or Moston, meaning passengers travelling from Rochdale and east of there will enjoy a faster journey time. Rochdale passengers will benefit from twice as many trains and passengers from Castleton, Mills Hill and Moston will have more seats on their trains. Northern is providing the services in partnership with Transport for Greater Manchester (TfGM). Major work has been completed to improve access and facilities for more than two million passengers who pass through Sittingbourne station every year. Two new lifts linked by a new footbridge have created a step-free route between the station entrance and platforms to provide better access to train services. The improvements have been funded through the government’s Access for All programme and cost around £1.8m. Train services were largely unaffected for the duration of the construction work and Network Rail worked closely with Southeastern to keep any disruption for passengers and line-side neighbours to a minimum. The search to find the best photography of the British landscape and that of the rail network is on. 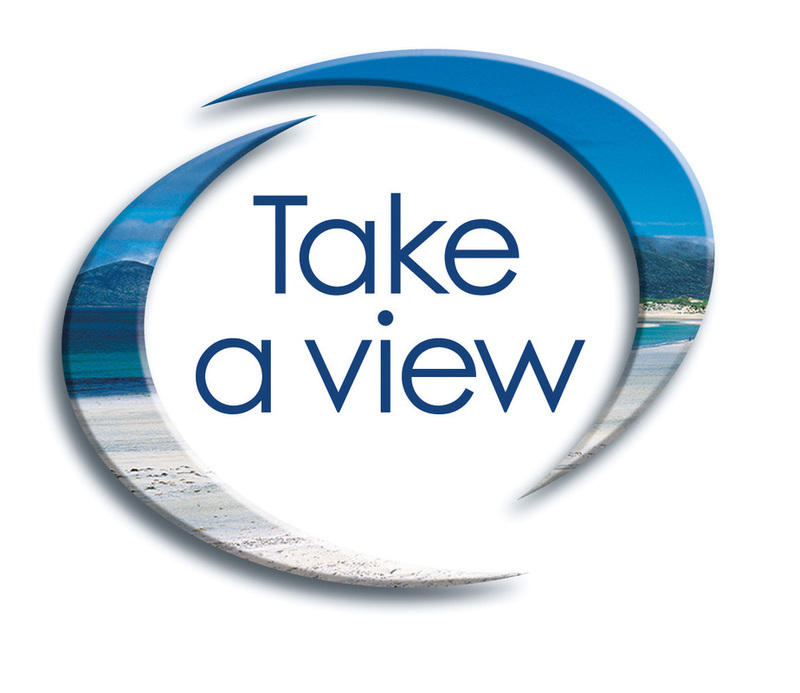 Entries are now open for the Take a view - Landscape Photographer of the Year Awards 2012. Photographers across Britain are being encouraged to showcase the best sights the country has to offer. For the third year, Network Rail is supporting this competition where amateurs and professional photographers can highlight the very best imagery of Britain’s beautiful rural and urban scenery and compete for the top prize of £10,000. The competition, now in its sixth year, is the idea of renowned landscape photographer, Charlie Waite, and the best images will be displayed at an exhibition at the National Theatre in London. An additional prize will be given for the best photography of Britain’s rail network – The Network Rail ‘Lines in the Landscape’ Special Award. Last year’s winner was Shahbaz Majeed from Dundee, with a beautiful shot of a train passing over the Tay Bridge at dusk. Tom Kelly, Network Rail’s director, corporate communications said: "This competition celebrates something very special: the way this country looks in all its different ways, some changing, some not. I am delighted that the railway, which forms such an important backdrop for both the urban and rural landscape in so many places, should be a part of it, and look forward with anticipation to seeing the entries." This year’s winner of the Lines in the Landscape award will receive a prize of a weekend break and has the option of joining a flight in Network Rail’s inspection helicopter which has onboard infrared technology to monitor thousands of miles of track, or a ride on the New Measurement Train, a converted high speed train that is used to capture geotechnical track data safely, punctually and reliably, collecting real time data and clocking up 80,000 miles per year. Either prize would offer a unique photography opportunity not open to the public. Southern’s ground-breaking smartcard – 'the key' is coming to stations between Brighton and Bexhill/Eastbourne via Lewes from 16 April 2012. The new smartcard technology - an alternative to paper tickets – makes it easier and quicker for passengers to buy and use tickets and comes to the East Coastway following a successful trial between Brighton and Seaford which started in October 2011. The new smartcard is reusable and can be recharged again and again with weekly and monthly season tickets. The key will be available for use at all stations on the line from Brighton to Bexhill and Eastbourne via Lewes and is already available between Brighton and Seaford. The key smartcard system allows passengers to purchase tickets online or via ticket machines at Southern stations and collect and travel in a one touch transaction. They can store and manage ticket products through their personal online account. Customers wishing to find out more and apply for the key can visit southernrailway.com/thekey from Monday 16th April. The key is the brand used by Go-Ahead Group companies such as Brighton & Hove Buses which already operates smartcard tickets. London Midland is moving a historic replica locomotive from its home of more than 25 years at Telford Central station on 18 April 2012. The life size model of the Trevithick locomotive will be lifted by crane into a low loader and taken the short distance to a new permanent home at the Hadley Learning Community. The model is a full scale replica of the first steam railway locomotive in the world, designed by Richard Trevithick and built near Ironbridge by the Coalbrookdale Company in 1803, 26 years before Stephenson's 'Rocket'. A plaque on the model states that the replica was built by Task Undertakings, a Manpower Services Commission project in Birmingham, under the guidance of Allen Gulliver, to drawings made for the Ironbridge Gorge Museum by Stewart Johnson. London Midland is donating the model to the Learning Community as part of a £1 million refurbishment of the station, part of the National Stations Improvement Programme (NSIP), a £150 million Government fund to improve station facilities. There are just under one million passenger journeys at Telford every year, and London Midland is upgrading the station to improve facilities for passengers. The model is being moved to make way for new seating areas for passengers. As part of the improvements at the station the booking hall, waiting areas and toilets will be completely refurbished, a new disabled accessible toilet installed, flooring will be upgraded and the outside walls will be fully glazed. A new waiting room and waiting shelter will be installed on Platform 2 while on the Birmingham-bound side; Platform 1, the platform canopy will be extended. The course takes an inspired approach to training to engage and inspire the attendees with the aim through an interactive approach to help employees identify and share best practice for the benefit of their customers. Greater Anglia is working closely with training provider ‘train4change’ on the project. In the second phase of the programme commencing in the autumn, a further 1,600 employees will participate in the training programme to also include operational staff and employees from other functions across the business ensuring a genuine focus on improving customer service amongst each and every Greater Anglia employee. The Rail Accident Investigation Branch (RAIB) has released its report into a collision between a train and a tractor at White House Farm user worked crossing on 25 September 2011. At approximately 10.13 hrs on Sunday 25 September 2011, the 10.10 Kings Lynn to Ely operated by First Capital Connect collided with a tractor at White House Farm user worked crossing. At the time of the accident, there were frequent movements of tractors and trailers over the crossing because of activity associated with the harvesting of sugar beet in an adjacent field. The tractor driver was telephoning the signaller at Kings Lynn to ask for permission to cross on each occasion. This was not the normal method of working; usually, crossing users would themselves check that it was safe to cross before doing so. The accident occurred because the signaller gave the tractor driver permission to cross before seeking confirmation that the train had passed. The tractor driver did not check for approaching trains because he considered that the signaller’s permission to cross was sufficient guarantee that it was safe to do so. the method adopted for working White House Farm UWC during the period of intensive use had not identified and controlled the potential risk arising from mis-communication between the signaller and the tractor driver. * The unavailability of local staff trained to earth the overhead line equipment delayed the detrainment of passengers from the train. the availability of staff trained in earthing overhead line equipment at remote locations. The main construction work has now begun on the creation of a new £11m station for Dalmarnock in Glasgow’s East End. Following extensive preparatory and enabling works, Network Rail and contractors C Spencer Ltd are now building a new station on Dalmarnock Road to replace the existing facility on Swanston Street. In order to construct the new station in a safe and secure way, the current facility will be closed to the public from 3 June 2012 to 25 November 2012. The station is being redeveloped in time for the Glasgow 2014 Commonwealth Games, when it will be a key transport hub for those travelling to and from many of the Games’ events. It is also a key element of the long-term regeneration of the East End of Glasgow. The project is being funded by Clyde Gateway, Glasgow City Council and Strathclyde Partnership for Transport, with an additional contribution secured through the European Regional Development Fund. Network Rail is delivering the project on behalf of Transport Scotland and the funding partners. The first stage of the project included a programme of advanced works, including site clearance as well as restoration and painting of the 15 concrete encased steel (over-rail) beams. These works commenced on site during August 2011 and were completed during December 2011. Minister for Transport, Keith Brown, added: "I'm delighted we have reached another milestone in the Dalmarnock station works. This cutting-edge transport hub will not only play a central role during the 2014 Games but help attract new businesses, commercial, housing and office developments as well as play a central role in the regeneration of Glasgow's East End for years after." Punctuality on the railways reached 93.4% during Period 13, according to monthly performance data released today by Network Rail. 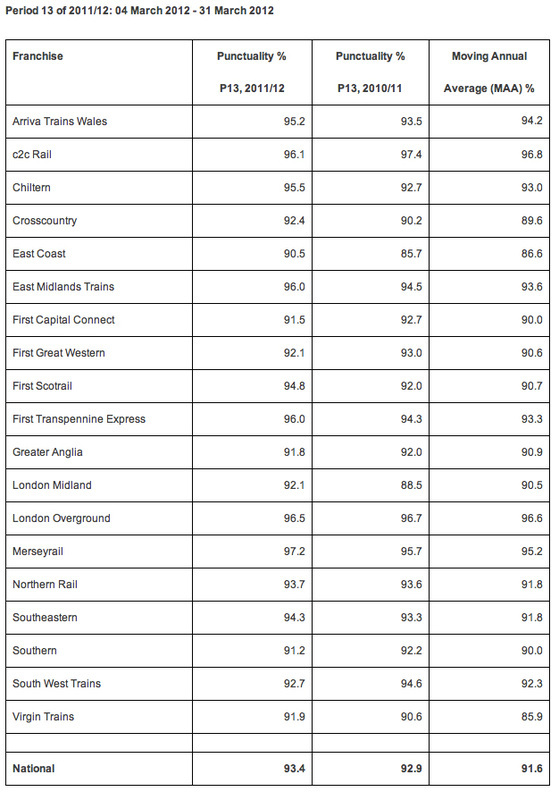 The data for Britain's train services covers the period from 04 March 2012 - 31 March 2012. This compares to 92.9% for the same period last year. The moving annual average is now at 91.6%. On 6 April 2012, Jean-Pierre Mourre, president of the Montpellier urban area, simultaneously inaugurated lines 3 and 4 of the town's tramway network in the presence of designer Christian Lacroix and Alstom Transport France CEO Jérôme Wallut. Line 3, at 19.8 km long, runs from the north of the Montpellier urban area to the south, passing through Juvignac, Montpellier itself, Lattes and, now that major development work on the Route de la Mer is complete, Pérols and the main towns on the way to the beaches. At more than 8 km, line 4 circumnavigates the town centre via the network of the town's three existing tramway lines. In total, 26 Citadis tramsets are being added to Montpellier’s urban transport network, 19 of which will run on line 3. Following on from previous orders for lines 1 and 2, this contract is evidence of the Montpellier urban area’s long-term confidence in Alstom Transport’s ability to support its urban transport development policy. 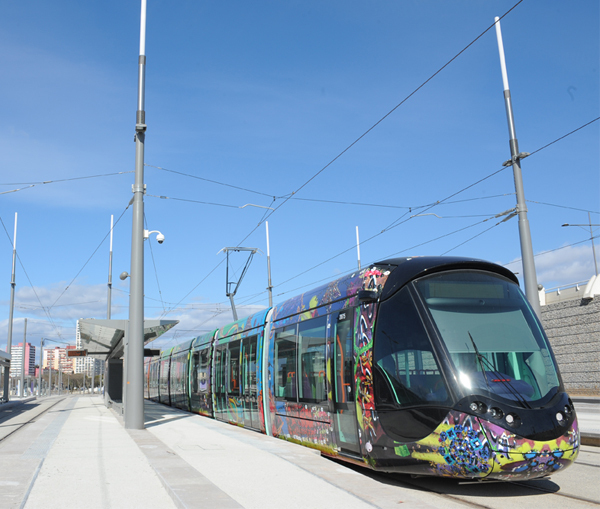 The Citadis tramsets used in Montpellier are built using standard technological components, which make up 80% of the final product. The remaining 20% can be customized, so Citadis offers each local authority the option of adapting its tramsets’ exterior style and interior fittings. Working closely with Christian Lacroix's teams, Alstom Transport’s design department is responsible for managing and planning the implementation of Lacroix’s design on these tramsets. The tram's nose has been customized, drawing inspiration from a diving mask. Similarly, the colour gradients and all of the interior fittings have been specially adapted. With designers, engineers and suppliers working very closely together right from the start of the project, Alstom has been able to ensure that the aesthetics of Montpellier's Citadis tramsets are in keeping with their technological excellence, and that they integrate harmoniously into the landscape through which they run. 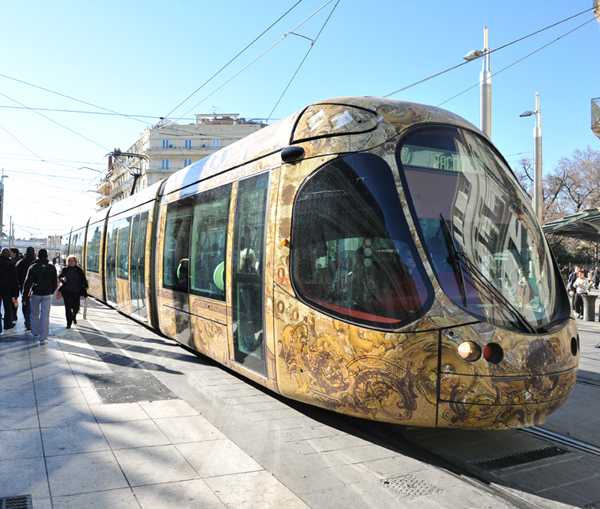 The tramsets in the Montpellier urban area are fitted with the latest Citadis-range equipment, all designed to ensure passenger comfort, including closed-circuit video surveillance, sound and visual information systems and integral low floors. Each tramset is 42-m long and can carry more than 300 passengers. The Citadis also enhances the quality of city life: four times quieter than road traffic, it generates about five decibels less noise. The Montpellier Citadis, like the rest of the range, has also been designed to be environmentally friendly: 98% of the materials used in making it can be recycled. The Citadis tramsets for the Montpellier urban area were designed and are currently being built at Alstom’s La Rochelle plant. Five other sites will also be involved in their manufacture: Ornans for the engines, Le Creusot for the bogies, Tarbes for the electrical and electronic equipment used in the traction systems, and Villeurbanne and Saint Ouen for the on-board electronics. To date, more than 1,600 tramsets have been sold to nearly 40 towns and cities throughout the world, including more than 800 tramsets for 20 towns in France in three different versions (22-, 32- and 42-m long). They have carried more than 4 billion passengers and have demonstrated their reliability over more than 250 million km. Alstom is therefore in a position to confirm the success of this model, which is much appreciated for its modular design and style. Bombardier Transportation has inaugurated a new, state-of-the-art monorail vehicle manufacturing facility in Hortolandia - Sao Paulo, Brazil. The new production site represents an investment of $15 million US and is Bombardier's global production centre for Monorails, serving the fast-growing market in Brazil as well as export opportunities in Latin America and around the world. It will generate 250 new jobs directly dedicated to railway vehicle production, including aluminum carbody, bogie and final assembly activities. In addition, approximately 500 indirect jobs will be created based on increased activity in Bombardier's local supplier base. The new investment underlines Bombardier's long-term commitment to Brazil, a market where the company has been active for many years. The Hortolandia Monorail manufacturing site was built in just 18 months and will start its manufacturing activities immediately. The first carbodies and bogies are already being manufactured there and the first completed monorail cars are expected to exit the assembly line later this year. The new site was designed and built following the most modern industrial standards worldwide and is based on technology transferred from Bombardier's manufacturing and engineering hubs in Kingston, Ontario, Canada; St. Bruno, Quebec, Canada; and Pittsburgh, Pennsylvania, USA. Andre Navarri, President and Chief Operating Officer, Bombardier Transportation, participated in the inauguration ceremony at the new site. The 100 guests in attendance included the Sao Paulo State Governor, Geraldo Alkmin, the Sao Paulo State Transport Secretary, Jurandir Fernandes, the Prime Minister of Quebec, Jean Charest, the Minister of Economic Development of Quebec, Sam Hamad, and representatives of Sao Paulo Metro and of other railway operators in Brazil, Bombardier suppliers and employees. Mr. Navarri was joined by Andre Guyvarch, President, Brazil, Bombardier Transportation and Serge van Themsche, Vice President EMEA and Brazil, Systems, Bombardier Transportation. This new monorail manufacturing site represents the second phase of Bombardier's industrial expansion initiated in 2009 that aims to triple our number of employees in Brazil to 600 people and to quadruple the industrial area in Hortolandia," Navarri said. "Even more important than the new industrial facility is the advanced monorail vehicle we are going to manufacture here - a fine example of our continuous focus on technology development in order to offer interconnected modality of public transport across the globe. One of Bombardier's key strengths is combining this worldwide experience with the local knowledge to deliver the best-fit mobility solution for each city individually." Navarri added: "The new high capacity BOMBARDIER INNOVIA Monorail 300 system we are building for Sao Paulo is game changing because it offers a transportation capacity similar to a metro, yet the light infrastructure required reduces the construction price and the implementation schedule by up to one half, bringing quality of life benefits to citizens sooner and more cost effectively. We are certain that once service operation starts, it will be acknowledged as one of the best mass transit solutions ever built." The INNOVIA Monorail 300 system is Bombardier's newest transportation system technology. Cost effective to introduce without requiring major infrastructure or civil works, it offers transport capacity up to 48,000 passengers per hour per direction. Whether transporting visitors to out-of-town destinations, or offering high capacity, frequent services for more densely used inner city routes, the INNOVIA Monorail 300 ensures passengers experience the ultimate in modern ride comfort. Bombardier's new manufacturing site is set to serve projects in Brazil as well as in the Latin America region. Its first order is the delivery of 54 seven-car INNOVIA Monorail 300 trains (378 cars) for Metro Sao Paulo. To ensure a successful and faster ramp-up of the project, one train (7 cars) will be produced and tested by Bombardier at the Kingston testing facility in Canada. The remaining Monorail cars will be produced at the new site in Brazil. The site will also result in a broader industrial development of the country due to the production requirements requested by Bombardier of its local suppliers. More than 15 companies have set up or expanded production in Brazil in response to Bombardier's requests. In addition, the most advanced manufacturing techniques will be applied, using lightweight, highly resistant aluminum and composite materials, making Bombardier the first railway company in Brazil to introduce new technologies for aluminum carbody manufacturing. In commencing work on one of the train operator's key franchise commitments, Greater Anglia has begun a comprehensive programme to deep clean its train fleet of over 1,000 vehicles in time for this summer's London Olympics. The interior deep clean of each unit includes work to steam clean all surfaces and floor coverings in each carriage including ceilings, floors and wall panels. Seat covers and carpets are being shampooed and the deep clean will also embrace cleaning of all seat backs, seat frames, luggage racks and the train toilets. Close attention is being given to thoroughly cleaning window frames and glass as well as the lighting units, replacing diffusers where necessary and ensuring that lighting levels in all coaches are set to a uniform standard. Work is being undertaken at Greater Anglia's train servicing depots at Orient Way in East London, Ilford and at Crown Point in Norwich. This comprehensive programme is transforming the interior environment of the company's fleet of train carriages to provide customers with much more pleasant and cleaner surroundings for their journeys with Greater Anglia. In addition to the interior deep cleaning of its trains, Greater Anglia is also hand-cleaning the exterior of each vehicle in time for the Olympics and this programme is well underway. National Express train operator c2c has been named the most punctual rail company in the UK, according to the latest punctuality performance results published by Network Rail. During the year ended 31 March 2012, 96.8% of c2c trains arrived on time according to the Public Performance Measure, the rail industry’s official classification of punctuality. This is the best performance of any UK rail company, and more than 5% higher than the UK-wide average performance of 91.6%. Siemens has been awarded an order to supply signaling systems for the nearly 16-km-long extension of metro Lines 2 and 3 in the Greek capital by operator Attiko Metro S.A. The scope of supply includes the electronic interlockings and outdoor equipment, as well as the trackside components for automatic train control system. Furthermore, 17 trains will be fitted with Siemens onboard units. The order is worth a total of around 41 million euros and calls for first phase to be commissioned in autumn 2013. Following the Siemens contract to equip metro lines 2 and 3 with signaling systems in 2002, the new project consists of two separate extension stages. The first stage will see Lines 2 and 3 equipped with signaling systems after being extended by a total of 8.5 kilometers and seven stations. The second phase will involve the installation of signaling systems on a 7.5-km extension of Line 3 up to the port of Piraeus, encompassing a total of six new stations. These extensions will provide urban developments with a metro link to the city center and are expected to significantly improve the traffic situation in Athens. Operator Attiko Metro expects a daily passenger volume of around 160,000 on completion of the first stage alone – the equivalent of roughly 30,000 fewer cars on the capital’s roads and a reduction of 130 metric tons in CO2 emissions. The signaling extension contract includes the delivery, installation and commission of Sicas electronic interlockings, LZB 705M automatic train control systems and a Vicos 111 operations control system as well as a complete facility for future staff training. The LZB 705M ATC (Automatic Train Control) system is a high performance ATP (Automatic Train Protection) and ATO (Automatic Train Operation) system, which optimizes punctuality and train headways. It also frees drivers from routine tasks, meaning that they can concentrate more on ensuring passenger safety. A ground breaking scheme to help visually impaired people find their way around Swansea’s transport services has been launched. Swansea Council has teamed up with, Arriva Trains Wales and the Royal National Institute of Blind People (RNIB) to produce special hand-held maps in braille and large print thanks to funding from the Welsh Government. The maps help to give public transport users who are blind or partially sighted the information they need to use the city’s new bus station and the central train station. Swansea City Bus Station has been redeveloped and the central train station is in the process of having a makeover. Sue King, RNIB's Tactile Images and Maps Consultant said: “In Swansea, the main transport facilities have been renovated and Swansea Council needs to do what they can to help inform users of the new layout and the facilities the stations offer. The new map initiative will provide blind and partially sighted people with the important information they need when using the bus and railway stations including where to buy tickets, where to get assistance, and other facilities such as toilets and shops. I’m not aware of any other town or city in the country that is providing a similar service. It is an extremely positive step forward in giving people with sight difficulties the opportunity of having such valuable information available to them personally." The maps will be made available from the information desks at Swansea City Bus Station and Swansea Railway Station. ScotRail has announced a £1million programme of improvements in passenger facilities at 19 stations in Glasgow and Lanarkshire in the run up to the Commonwealth Games in 2014. This will meet a commitment to Scottish Ministers to deliver enhancements to support spectators travelling by rail to the Games events. Work will begin later this year at stations close to key venues and at ‘feeder’ stations which are expected to be used by many passengers throughout the major international sporting event in summer 2014. These will include new customer information screens, waiting shelters, seating and lighting. ScotRail will also work with Network Rail on a series of refurbishments at stations during scheduled maintenance periods. In addition around £600,000 of funding, from Transport Scotland and Strathclyde Partnership for Transport, has been secured for further improvements – particularly to access – at 11 stations in Glasgow and Lanarkshire as well as Carnoustie, Angus. Rail users will see the changes take shape gradually from now and the Commonwealth Games. David Simpson, Network Rail route managing director for Scotland, added: "We are pleased to be working with ScotRail to further enhance stations ahead of the Commonwealth Games. As rail travel continues to grow in popularity it is vital we ensure passengers are provided with the best possible facilities at our stations." Work has started on a major revamp of all the railway tracks and signalling in and around Stalybridge station, which will also see alterations to the platforms, coffee shop and other passenger facilities. The £20m project is needed because the existing infrastructure is nearing the end of its operational life. The opportunity is being taken to replace it in such a way that it will meet current needs and those of the future when the line from Manchester is electrified in 2016. As well as renewing the tracks, the signalling system will be replaced to reflect the changes, and the speed of trains passing through the station will increase from 40 to 50 mph. Control of train movements in the area will transfer to Manchester East signalling centre in Edgeley, Stockport. The work means that the station will have five platforms in future instead of three, so the existing numbering will be completely changed. Once the new platforms have been built an Access for All scheme funded by the Department for Transport will link all platforms. New passenger operated lifts will be built taking passengers down to the recently refurbished subway, giving disabled passengers, people with buggies and those with lots of luggage, step-free access to the entire station. Work will continue every weekend until November, except for the period of the Olympic Games, when all major disruptive railway work is suspended. The new signalling system will be commissioned and brought into use in early November. To relay the junction and carry out the necessary safety tests on the new equipment, there will be no train services from Stalybridge station for nine days over the last week of October and first week of November. Network Rail has restored an iconic structure that was used by world famous railway model maker Hornby as the basis for one of its construction kits. 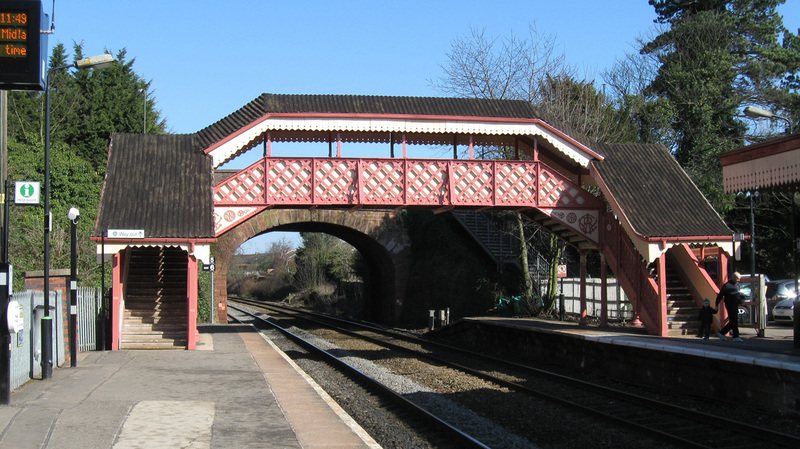 The station footbridge in the Worcestershire village of Hagley is Grade 2 listed and was built in 1884 by the Great Western Railway, 32 years after the station opened on Saturday 1 May 1852. The last time the footbridge was painted, a blue and white colour scheme was chosen but after talking to the Railway Heritage Trust, Network Rail has restored it to what is known as GWR ‘light and dark stone’. The entire structure has been cleaned, rubbed down and repainted. Elements of the ornate metalwork that needed replacing were specially cast to match and blend in with the original. Various parts of the structure's fabric were replaced or repaired. These included wooden dagger boards, panelling and sections of guttering, with the edges of the stair treads being coated in an anti slip resin in contrasting colours to make them stand out. While the contractors were on site, the station buildings were also completely repainted at the request of train operator London Midland as was the platform canopy, so the entire station has a new feel to it. The overall cost of the work was almost £50,000. Greater Anglia has announced plans to provide additional and substantial financial support for the region’s Community Rail Partnerships (CRPs) through a new investment of £125k to support the work of the CRPs as part of the train operator’s current franchise term. £50k will be invested immediately to provide extra support this year for the work of the partnerships which include the Essex & South Suffolk, East Suffolk Line, Bittern Line and Wherry Lines CRPs. As well as the established partnerships, Greater Anglia is also preparing for the launch of a new Fenland CRP by local stakeholders in Cambridgeshire this summer embracing the Ely to Peterborough route. Greater Anglia is strongly committed to the concept of rail partnerships and positive co-operation with local stakeholders as a means of improving the marketing and awareness of local rail services, and helping to develop those services for the benefit of the communities they serve, whilst boosting tourism and contributing to the local economy. Greater Anglia is also increasing the support it provides for its network of station adopters as part of this package, with many adopters also working in partnership with their local CRPs. Plans to renew the canopies and remove part of the redundant spine wall at Kirkgate station have today been granted Listed Building consent by Wakefield District Council planning committee. Phil Verster, route managing director at Network Rail, said: “This is the news we have been waiting for at Kirkgate. Our team is already on site completing preparatory works and will press ahead with the full scheme immediately." The Network Rail work on the station is worth approximately £1.5m and is being funded by the company with a contribution from the Railway Heritage Trust. Bricks which are removed from the spine wall will be cleaned and reused in the supporting wall for the new ramp. "I'm delighted that the planning committee has given its consent, and that the next phase of work at Wakefield Kirkgate rail station can now go ahead," said David Hoggarth, director, development at Metro. "Through partnership working between Metro, Network Rail, Wakefield Council, the train operators and Groundwork Wakefield, we are on the road to delivering a much needed step-change in facilities for passengers." Richard Allen, area Director for Northern Rail comments: "We are thrilled to continue to be part of the transformation at Wakefield Kirkgate. The improvements being made at the station are an excellent example of a successful partnership achieving real results for our customers." Ken Taylor, executive director for Groundwork Wakefield, said: "Groundwork, along with partners, is committed to bringing the station back to its former glory and it will be a catalyst for the regeneration of the entire Kirkgate area. Not only will the redevelopment provide a safe and welcoming gateway to the city, it will provide facilities for local communities, enterprises to grow in and foster a sense of community pride into the area." In 2009 and 2010, Northern Rail, Network Rail and Metro secured improvements to the CCTV system and subway as well as improvements to signage, a new help point and refurbished entrance lobby. The car park was also resurfaced, allowing the free bus to call at the station. This was mainly funded through the National Stations Improvement Programme, a joint rail industry initiative funded primarily by the Department for Transport. Rail passengers across the West Midlands are set to benefit from a raft of station improvements following a unique partnership deal between Centro, the region’s transport authority and train operator London Midland. A total of ten stations are in line for improvements including cutting edge passenger information, automated ticket machines and cycle storage facilities. The work is the result of the recently signed Transforming Rail Travel agreement – a partnership between Centro and London Midland to further improve journeys for the 42 million passengers who use the West Midlands network each year. Under the deal Centro will fund the £250,000 improvements and London Midland will carry out the work. Birmingham Snow Hill – Customer Information System (CIS) improvements to include new information screens at the station entrance and an extension of the automated public address system. New cycle storage will also be installed. Tipton – CIS improvements on the Birmingham bound platform. Whitlocks End – CIS summary departure screens (for the entrance points onto both platforms). Bournville and University which will get additional ticket vending machines helping to reduce queues for tickets at peak times. Centro is exploring the feasibility of locating one of the machines at University on the BirminghamUniversity campus. London Midland's Head of Franchise Management, Nicola Moss said: "This investment shows how by working together in partnership, Centro and London Midland can deliver real improvements to rail services in the West Midlands. This is really good news for customers at the ten stations in the scheme." Although Alvechurch and the Chase Line stations of Landywood and RugeleyTown are outside the metropolitan West Midlands, Centro considers them important stops in the wider journey-to-work area. Centro also recently contributed £900,000 to a separate package of improvements to stations along the Chase Line. The work at Snow Hill is part of a bigger £1 million project to upgrade its facilities under the National Stations Improvement Programme (NSIP). The project is due for completion by 2014. When Crossrail services begin, even more trains will travel along the Great Western Main Line so work is needed to improve capacity. The current junction at Stockley allows trains to leave the main line and continue to Heathrow Airport. Network Rail, on behalf of Crossrail Limited, will build a new single track viaduct for all trains from Heathrow towards London. Work is due to complete in 2017. Existing train services to Heathrow will continue to run throughout. Stockley Interchange will allow Crossrail trains to join the branch to Heathrow without delaying - or being delayed by - fast trains to the west, thus increasing capacity and reliability on the extremely busy Great Western Main Line. Crossrail trains from Heathrow will run into Paddington and under London in newly-constructed tunnels. The service will offer the ability to travel from Heathrow to the West End, the City, and Canary Wharf without changing, reducing journey times and inconvenience. When Crossrail opens, passengers will be able to reach Heathrow from Canary Wharf in 39 minutes, Liverpool Street in 33 minutes and Bond Street in 26 minutes. As this work progresses it is likely to involve some night-time and weekend working, as some sections can only be built when train services are not running. Railway passengers, particularly those with restricted mobility, will find their journeys from London Overground's West Croydon station made easier when a new gateline offering a direct link to adjacent tram and bus stops opens. Work on the new gateline which begins on Tuesday 10 April 2012 and is scheduled to last for eight weeks, will provide a more direct walking route from the West Croydon tram stop and bus station on Station Street to West Croydon London Overground station. The largest-ever scheme to modernise the 1960s signalling infrastructure on the Great Western main line has started. The £400m improvement will significantly benefit services travelling through Bristol, Bath, Chippenham, Swindon, Didcot, Reading, Newbury and Oxford. The four-year scheme, once completed, could help cut delays by 50%, thus significantly boosting rail performance. Around 25,000 minutes of delays on average each year on the Great Western main line are potentially caused by problems with aging signalling equipment. The major upgrade will also support the 10-year plan to expand services on the Great Western main line, catering to the 51% forecast increase in rail demand by the end of the decade. In addition, the improvement work is also vital to prepare the signalling infrastructure, so that it is compatible with an electrified railway. The improvement will be carried out in five stages, starting from the Didcot area, to minimise disruption. Invensys has recently been appointed as the main contractor to deliver the work in the Didcot area. The biggest programme of work will be carried out in the Bristol area, which is forecast to experience the highest number of passenger growth of 44% in the next decade. Around £150m will be invested in upgrading the signalling infrastructure in the area. The programme of work is designed to complement the capacity-boosting proposal to revamp the railway track around Bristol Temple Meads. Around £50m will be invested between Swindon and Chippenham and Swindon and Gloucester as part of this scheme. This work will complement the scheme to redouble the track between Swindon and Kemble, bringing better performance and potentially enabling more trains to run. Around £20m will be invested in upgrading the signalling between Newbury and Reading. As part of this programme, work will be carried out to upgrade existing tracks to allow passenger trains to run. This will enable better train movement and potentially allow more trains to run, especially in times of congestions on race days at Newbury. The signalling upgrade forms part of a wider ten-year, £5bn plan to transform the Great Western main line. The transformation programme comprises of several core packages of work, including electrification, between London and Bristol. The signalling upgrade is the first core package of work in this transformation programme. The Sunderland line of the Tyne and Wear Metro is celebrating its 10th birthday, having carried more than 40 million passengers since opening. Opened to the public on 31 March 31 2002, the line transformed travel between the two biggest cities in the North East, and continues to do so today. The Sunderland line added a new route of 18km and 12 stations to the Metro network from Pelaw through Sunderland City Centre to South Hylton. Her Majesty, Queen Elizabeth II, officially opened the line during her Golden Jubilee year, travelling with the Duke of Edinburgh on 7 May 2002, from Park Lane Interchange to Fellgate, South Tyneside. Bernard Garner, Director General of Nexus, which owns and manages Metro, said: “Building and opening the Sunderland Metro line meant overcoming huge technical and financial challenges, but the difference it makes is there to see every day. Metro helped open the door to attracting people to Sunderland from far and wide, whether it is to shop, to visit, to study at Sunderland University or attend world-class sport and culture at The Stadium of Light. Richard McClean, Managing Director of Metro operator DB Regio Tyne and Wear said: “The Sunderland line is a great asset to the North East and over 40 million journeys have been made on this line in the last 10 years. Metro provides a vital link across the whole of Tyne and Wear which has helped to boost the economy in Sunderland and Newcastle as well as the surrounding towns. Many people use Metro to commute to and from work and over four million journeys have been made on the Sunderland line alone in the last 12 months. The whole project to build the Sunderland line involved some unique engineering challenges. Around 13km of line between Pelaw and Sunderland were converted to Metro use by installing overhead power lines and some of the most advanced signal systems in the UK. The line marked a milestone for the rail industry as, for the first time in the UK, local light rail and national heavy rail began sharing the same tracks, with Sunderland station playing host to Metro, Northern regional trains and now Grand Central intercity trains to London from the same platforms. A further 4.5km of line was built from Sunderland to South Hylton using a disused railway route, until then used as a cycle path. A brand new transport interchange was also built at Park Lane, creating a major new bus station above the Metro line. At Fellgate station, lift shafts had to be built without disturbing the 160-year-old railway embankment and at St Peter’s a new station had to be created without damaging the historic stone viaduct, a listed structure. Eight new stations were built and three converted to Metro use from national rail, while Sunderland continues to be used by both. Sunderland station’s platforms were refurbished by Nexus in a £7m project completed in 2010, creating a new city centre gateway. The opening of the line has seen the number of trains between Newcastle and Sunderland increase to five an hour. A journey between the two city centres takes less than 30 minutes, while Metro links Sunderland to Newcastle International Airport in around 45 minutes. Porterbrook has reached an agreement with Direct Rail Services for the lease of three Class 57 locomotives. Direct Rail Services specialises in hauling freight for a range of customers throughout the country. Due to continued market growth they sought to lease an additional three Class 57 locomotives, numbers 57302, 57304 and 57309 which were handed back from Virgin Trains at the end of March 2012, to complement their existing Class 57 fleet. They will be on lease until 2015. The three locomotives operated light from Manchester to Eastleigh Works on 4 April 2012 for upgrade work and repainting. Ian Lee has been appointed as Health, Safety and Environmental Manager for First Hull Trains. Ian will head up a team which oversees the effective and safe running of the company’s services between Hull and London. Ian has moved to First Hull Trains from First Capital Connect where as the Safety Project Manager he was in charge of the safety management arrangements on the Thameslink Programme and King's Cross Station Redevelopment in London. With over 40 years’ experience in the industry, Ian is relishing the opportunity in this new career challenge. He said: “I decided to move to First Hull Trains as I wanted to get more involved with day to day safety management. My most recent position was in a strategic role and I wanted a post in which I could have a combination of the two. "The Health, Safety and Environmental Manager at First Hull Trains provide the perfect opportunity. I am a dedicated safety professional who believes totally in the fantastic work that First Hull Trains has been doing to improve its safety management performance and systems. I feel that there is a lot I can offer the company in terms of my experience, skills and knowledge and I want to make a real impact. I aim to put together a programme to continually improve and achieve safety excellence." Ian’s role will see him providing support and guidance to managers to ensure First Hull Trains continues to deliver high standards of safety in all that the company does. Ian joined the company at the end of March 2012. Alstom Transport will manufacture 28 Coradia Continental regional trains for the German operator Deutsche Bahn Regio NRW GmbH. The contract is worth approximately €140 million. This is the first stage of the frame contract signed in 2011 with DB Regio for the delivery of up to 400 trains. The trains will run on the Rhine-Ruhr transport network in North Rhine-Westphalia (NRW). They will enter service for DB Regio NRW GmbH in 2014.The Coradia Continental trains will be manufactured at the Alstom Salzgitter site in Germany, where a high level of experience is guaranteed: 141 trains of the same type have already been built there. "We are glad that Deutsche Bahn has selected our modern and reliable trains. Our concept of the Coradia Continental offers high flexibility for our customers and maximal comfort for passengers. We are delighted to be contributing to the further development of transport services in North Rhine-Westphalia", said Dr. Martin Lange, Alstom Transport Managing Director in Germany. The Coradia Continental trains can run at maximum speed of 160 km/h with an excellent acceleration rate. With a capacity of up to 170 seats and 173 standing places for passengers, these trains can use double and triple traction regimes. DB Regio intends to use them for the S5 and S8 suburban tramlines from Dortmund to Mönchengladbach. Eco-friendly technologies have also been implemented. Regenerative brakes allow the braking energy to be recovered – up to 30% can be fed back into the electrical power network. Due to the utilisation of the latest crash components, the trains meet highest levels of safety and already comply with the EN 15227 norm which will become compulsory in Europe from 2013 onwards. The trains have been adapted according to specific wishes of the customer. For the first time on this railway lines toilets will be fitted for disabled passengers. Modifications for people with reduced mobility and visual impairments have also been made: audio cues, side handrails, signage and electric lighting to improve spatial awareness. Multifunctional areas for wheelchairs, bicycles and baby carriages, as well as surveillance cameras inside each car, will ensure passenger comfort and safety. Wide central aisles facilitate movement inside and between the cars, since the driving gear equipment has been moved to the roof. A sliding step can be used to seal the gap between the platform and the car, thus ensuring safe boarding and alighting for passengers. On 26 May 2012, GB Railfreight (GBRf) are inviting rail fans and guests to join them aboard a charity train to York, with all monies raised being donated to the Motor Neurone Disease Association (MNDA). The train will be planned and worked by GBRf staff, who are all giving their time and energy for free. Called The Shambles, after the famous street of the same name in York, the train will pick up at Shenfield, Stratford, Finsbury Park, Stevenage and Peterborough for the day trip. Guests will have approximately four hours to enjoy the sights and shopping of the city before the return journey. MNDA is the only national charity for England, Wales and Northern Ireland that funds and promotes research into Motor Neurone Disease, which affects about 5,000 people across the UK. It also provides support for sufferers of the condition. There is no known cure for MND and about half of those affected die within 14 months of diagnosis. The money raised by events such as this charity train trip is vital in helping those with the condition and their families, and can make a vast improvement to people’s day-to-day lives. The train itself will be operated by Class 317 Electric Units provided free of charge by Greater Anglia. York is a city steeped in history and boasts many attractions, from the National Railway Museum to the JORVIK Viking Centre, tangled cobbled shopping streets and the iconic York Minster. Tickets for the charity train ride are being sold through UK Railtours for a minimum donation of £20 each. Today’s sentencing at Preston Crown Court marks the end of the rail regulator’s criminal prosecution against Network Rail. On 23 February 2007, the 17.15 Virgin Trains service from London Euston to Glasgow Central derailed on the West Coast Mainline near Grayrigg in Cumbria. 109 people were on board. Mrs Margaret Masson, a passenger travelling in the first carriage, was killed. Of the 86 people injured, 28 were seriously hurt. At Lancaster Magistrates’ Court on 29 February 2012, Network Rail pleaded guilty to one charge under section 3(1) of the Health and Safety at Work etc Act 1974. This results from the company’s failure to provide and implement suitable and sufficient standards, procedures, guidance, training, tools and resources for the inspection and maintenance of fixed stretcher-bar points. Network Rail is holding its third consultation in Staffordshire to give members of the public the opportunity to comment on plans to solve one of the few remaining bottlenecks on the key rail line connecting London Birmingham Manchester and Scotland. Last year a preferred scheme was announced which included plans for a new flyover to take Birmingham to Manchester trains up and over the main line rather than across it. Separating the path of services will improve reliability and allow more trains to run on the route. A second round of public consultation was held in October last year to explore details about construction, road diversions and footpath alterations. After analysis of the feedback and further development of the scheme it was found the road and footpath changes would be complex and disruptive. Further options have now been developed and will undergo consultation with the local community over the coming weeks. Subject to feedback, it is anticipated a final round of consultation will be held in the summer ahead of submission of the plans to the National Infrastructure Planning Unit in December. Consultation will take place on diversions to the B5026 around Scamnell Lane and Station Road, Staffordshire and also on footpath 11 in Chebsey. As part of the National Station Improvement Programme (NSIP) First Capital Connect (FCC) has installed new waiting shelters at a number of their stations. The new shelters are built with modern materials and incorporate the latest solar technology and LED lighting with intelligent switching to ensure that light is only provided when required. NSIP is a Department for Transport programme with the aim of delivering noticeable and lasting improvements to stations for the benefit of passengers. This leads to an improvement in the passenger and public perception of the chosen stations. From today, residents and Easter holiday visitors to Blackpool will have the opportunity to enjoy their first ride on the very latest tram technology by Bombardier – the BOMBARDIER FLEXITY 2. Todays opening ceremony to celebrate the event was hosted by Norman Baker MP, Parliamentary Under-Secretary of State for Transport. The project to upgrade the tram system has been cofundedby the Department for Transport (DfT) and Blackpool and Lancashire County Councils. Blackpool will operate 16 new, ultra-modern FLEXITY 2 vehicles on the Blackpool and Fleetwood tramway alongside the popular heritage fleet. In 2010 Blackpool celebrated its 125th year of operation, as the longest operating tram system in the UK. The popular tourist destination’s trams transport 4 million passengers each year, with the majority travelling during the busy summer period. The FLEXITY 2 tram is based on Bombardier’s highly successful FLEXITY family of light rail vehicles and combines proven technology with continuous improvement and innovation. As well as having 100% low floor technology for optimal ride comfort, the FLEXITY 2 tram includes some new advanced features, such as touch-screens in the driver’s cab, reflecting the latest developments in intelligent digital technology. To date, more than 3,500 trams and light rail vehicles from Bombardier have been ordered or delivered in around 100 cities in more than 20 countries. Blackpool is the latest location in the UK to operate Bombardier’s light rail solutions in addition to Croydon and Docklands in London, Nottingham and Manchester. customer to opt for the world-leading FLEXITY 2 trams. Network Rail has recently completed two projects at Stalybridge railway station which together represent an investment of nearly £500,000. The back room of the station buffet bar has been fully refurbished and now has numerous posters, prints, mirrors and pieces of railway memorabilia, including ladies room and waiting room signs. Lord Pendry of Stalybridge, who often uses the buffet bar and contributed over half of the £6,000 costs, unveiled a plaque to mark the refurbishment. Speaking at the unveiling, he said that contrary to popular belief, he hadn't been using the buffet since the station opened in 1845. He also said that Network Rail had shown a commitment to the station that its predecessors hadn't. The original plaster ceiling rose and cornices have been retained, and moulds of the existing architrave were taken so that damaged sections could be replicated. The walls had their plaster removed completely and a new skim applied using heritage materials. They were then decorated in a blush pink colour as chosen by the landlady. Finally, the wooden floor was sanded, coated and glossed. A new apex canopy was designed so that the rear section would be strong enough to be walked on for cleaning and keeping the gutters clear and the front section glazed to allow natural light to flood the platform. The capacity of the guttering between the canopy and station building has been increased as have the water down pipes which will guard against the drainage system overflowing and affecting the building. A new lighting system has been installed underneath the canopy. Steelwork has been stripped back to bare metal, repaired where necessary, treated and repainted as have the supporting columns with their intricate ironwork. Now the station has a stunning canopy, in blue and white that compliments earlier work carried out on the subway linking the platforms, and the station entrance and ticket hall. The result of a fares review for Nottingham’s tram network has been announced. A new fares structure will be introduced in the middle of April and, whilst some tram ticket prices have been maintained at current levels, others are scheduled to increase. Patrick Kron, Chairman and CEO of Alstom, has declared his great satisfaction at the SNCF’s signing of the contract option for 40 additional double-deck Euroduplex very high speed trains on 30 March 2012. Taking into account a possible cancellation of 10 trains, Alstom booked an order corresponding to 30 train sets in the last quarter of the 2011/12 fiscal year, for a value of around €900 million. This new order is included in the framework of the contract placed with Alstom by SNCF on 27 June 2007. The 40 trains are in addition to the firm tranche of 55 Euroduplex train sets currently under construction, the first of which entered commercial service on 11 December 2011 on the new Rhine-Rhône high speed line and the last units being delivered mid-2015. The additional train sets will be delivered from 2015. Their manufacture will contribute to the workload of Alstom Transport’s La Rochelle site which builds the passenger cars as well as the workload of other sites in France: Belfort (locomotives), Reichshoffen (end cars), Le Creusot (bogies), Ornans (traction systems), Le Petit Quevilly (locomotive transformers), Tarbes (electrical units and traction equipment) and Villeurbanne (electronic control systems). Charleroi (Belgium) for auxiliary inverters and Montreal (Canada) for passenger information systems are also part of the manufacturing scheme. A total of 1,500 people on these sites work each day on high speed rail transport projects at Alstom. The main French suppliers for this project are Faiveley Transport, Logitrade, COMECA, CEIT, TFCM and Association Bretagne Atelier. Together with the other small to medium sized companies involved in the French rail industry, they employ 6,000 people in France. Intended for use on the French, German, Swiss and Luxembourg networks, the Euroduplex trains contain signalling equipment which is compatible with all European networks. They are equipped with traction systems adapted to the different electric currents used across Europe. Some of these train sets can also run in Spain. Benefiting from Alstom’s unique and long experience in the very high speed rail market, Euroduplex trains offer the best operating costs per corridor and the highest return per seat. With the taking-up of this option, Patrick Kron announced that Alstom has proposed to end its legal process in the London High Court, opened to contest the call for tender launched in 2009 by Eurostar to renew its fleet. Falls of Cruachan is a summer-only request stop on the West Highland Line. It is particularly popular with hill-walkers and tourists travelling to Cruachan Power Station Visitor Centre. Siemens is opening the gates of its state-of-the-art traincare facility in Northampton to local families on Saturday 5 May, in partnership with London Midland. The behind-the-scenes tour will showcase the technology and dedicated maintenance team behind the 67-strong fleet of London Midland-operated Siemens Desiro Class 350/1 and 350/2 trains based at the Kings Heath site. Lucky visitors will take a ride on a land train to the depot entrance before the tour, which includes seeing a train on jacks ready for maintenance activities and a chance to sit in a driver’s cab. The winner of our competition to name the four maintenance teams based at the depot will also be announced, and visitors can also show off their artistic skills with our family-friendly activities. This free event also aims to raise money in aid of Northampton General Hospital’s special care baby unit with stalls selling items donated by Siemens and London Midland employees. Mike Dalton at London Midland says: "This will be a real opportunity for people to see the hard work that goes on behind the scenes in providing rail services. The fact that the event will also be raising money for such a special cause is even better reason for people to visit." The event is restricted to ticket holders only. To register your interest for a tour and obtain your FREE ticket, please visit www.siemens.co.uk/whistlestoptour. Please note children younger than three years of age cannot be accepted on the tours. Find us on Facebook at facebook.com/WhistleStopTour. Due to high demand, a second open day is also being arranged specifically for train enthusiasts and employees of both Siemens and London Midland. A date for this will be announced shortly.